The Philippines' bid to stage a major international hoops event came to a screeching halt when the FIBA Central Board awarded China the rights to be the host country for the 2019 FIBA Basketball World Cup last Friday night (August 7). Our country's final pitch, which focused on the Pinoy's passion for the sport and social media savvy, wasn't able to work its magic with the board. They seemed to have been swayed by China's presentation, which centered on their infrastructures and overall progress. 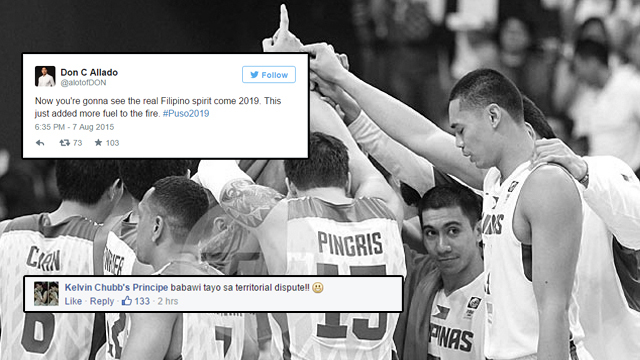 Though it was a sad day for our nation, netizens readily consoled one another with heartfelt and encouraging messages, bannered by the hashtag #PUSO2019. One of the presentors, former Gilas Pilipinas coach Chot Reyes, brought up a rather interesting point. Sportscasters and sports journalists also joined the conversation-slash-mudslinging. Dear @FIBA, we would have absolutely killed it here. But yeah, you do you. We'll see you in China. #PUSO2019 pa rin. The players themselves, meanwhile, started their offensive. Some even managed to make light of the situation.